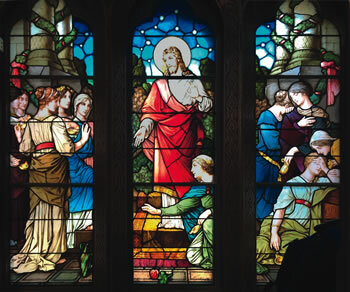 Jesus often spoke in parables that his listeners could relate to. We have read them or heard them proclaimed often enough, but do we understand them in our culture? 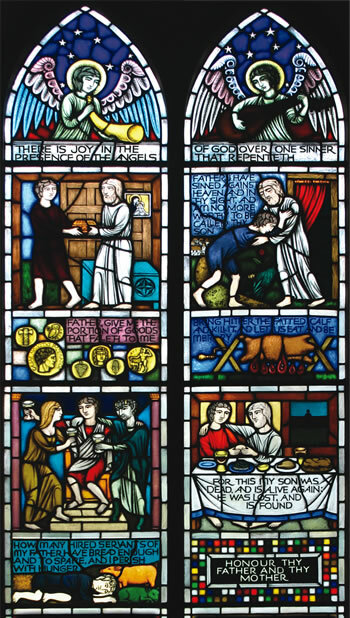 Some of them have been enshrined in stained glass, which may help us to understand. Take the Parable of the Foolish Virgins, for example. 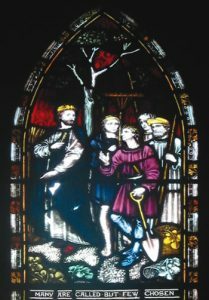 This window from St Mary of the Angels, Wellington  sets the scene. The look of desperation on the faces of the virgins who have run out of oil for their lamps is patently obvious – their lack of preparedness has cost them dearly. The window below from Chapel St Rose, La Crosse, Wisconsin, USA  (thanks to my sister Sharon Attwood for the photo) is similar, except it shows Jesus as the bridegroom. The desperation of the unprepared is just as obvious. The meaning we can take is that it will cost us dearly if we are not prepared to meet our maker – anytime! The Parable of the Talents is an interesting one, because a talent was a coin in Jesus’ time. 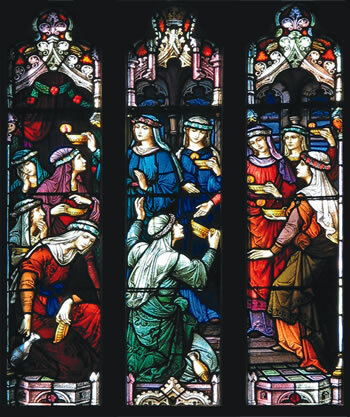 Today, we think of the parable in terms of the talents we have been gifted with. If we sit back like the man who buried his talent, we lose everything in hell. 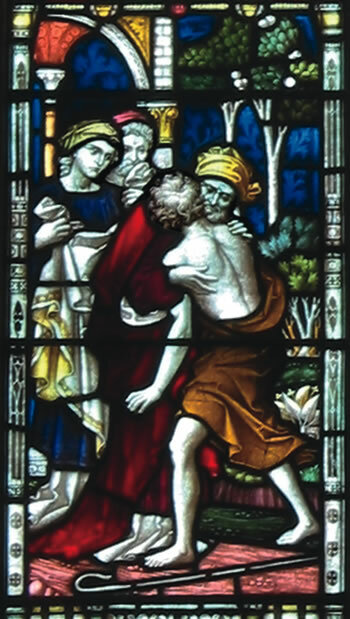 This window, from St Mary of the Angels, Wellington , shows that man being led away, bound, to serve his punishment. 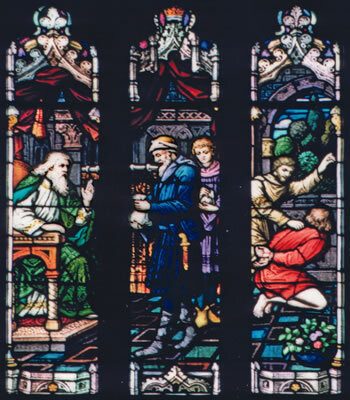 A similar part-window in St Patrick’s Cathedral, Palmerston North  shows the scene a little more colourfully, although the condemned man is not bound. 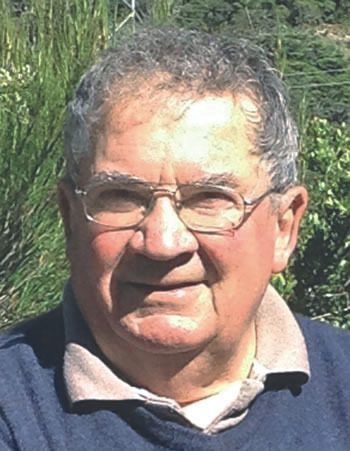 No doubt the genuflecting supplicant is the two-talent man, while the standing one has twenty talents in his moneybag and feels there is no need to kneel. Do you think you can stand before God? Or should you be kneeling in supplication? 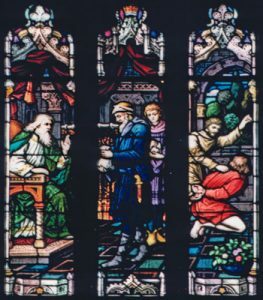 It is interesting to note that a talent was the equivelant of 15 years’ wages for a labourer, so it is no wonder the scene in both windows is sumptuous. Also sumptuous would have been the setting for the Parable of the Wedding Feast. I always wondered about this parable - I understood that the invited who rejected Jesus were destined for hell, and the good and bad who were gathered afterwards were sinners who were saved. But why condemn the sinner because he was badly dressed? Then I found out that everyone who attended the wedding was given a robe to wear. The man condemned had simply refused to wear the robe, that is to say, refused to be saved. 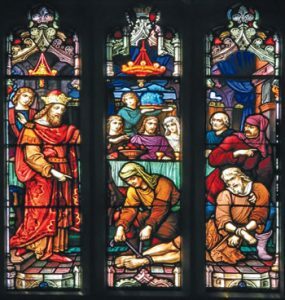 In the colourful window  from St Mary of the Angels, there is the King, the bridal party, the sinner bound hand and foot. Little is left to the imagination. 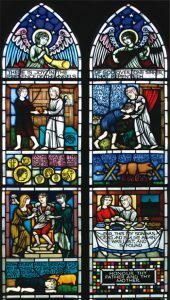 The window below from St Mary Abbots, Kensington, London  spells out the last sentence of the parable “Many are called but few are chosen”. 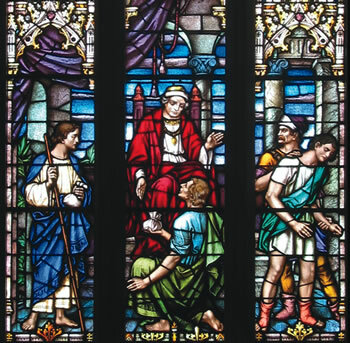 It depicts a figure I take to be the King’s steward leading the people gathered from the streets - all of them workers. To me, the message is quite simple - reject or ignore Jesus at my peril. 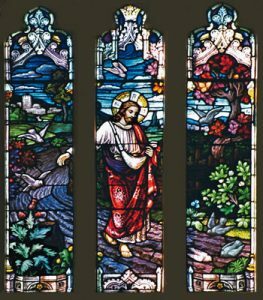 This window  in St John’s Cathedral, Parramatta, NSW, tells the same story, except the sower is actually a farmer rather than Jesus. In any event, let us be ‘good ground’ people who hear, understand and act on the Word of God. 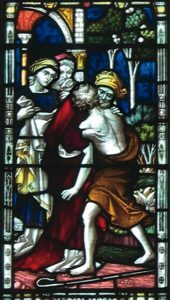 Finally, we also know the Parable of the Prodigal Son, how the father forgave the son for rejecting him and wasting his inheritance. This window  from St Michael’s, Kelburn, Wellington, tells the story in a number of cartoons. Missing is the other son, who could not accept that the Father could forgive his brother. 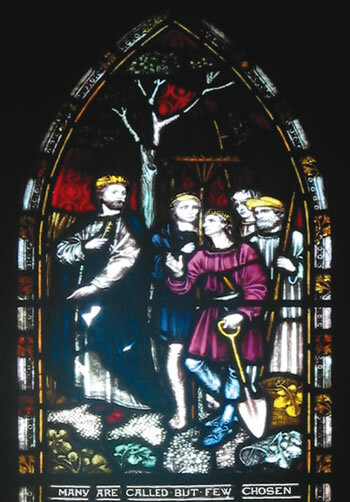 He is shown in this part-window  in St Patrick’s Cathedral, Palmerston North. Of course, God is the all-forgiving Father and you and I are the prodigal son. Put yourself in the scene in this window  in the ruined Christchurch Cathedral, and pray that we never test God’s forgiveness or lack forgiveness ourselves.